4 hours of wrapping- kid's gifts done, Haldan's gifts done, secret santa gifts done, 55 cupcakes done, friends, neighbors, and teachers gifts done. What a great feeling to be able to check it all off my list. I have to add that I absolutely despise wrapping. I would rather clean toilets than wrap. I'm not really sure why. I enjoy and appreciate a nicely wrapped gift. Maybe it's the chaos of it all. Glad to be done. The cupcakes went much more smoothly this time around. I was more together and started looking for the ingredients last week. Wish I would have started on the candy eyes sooner. We had to settle on that, but everything else was fine. 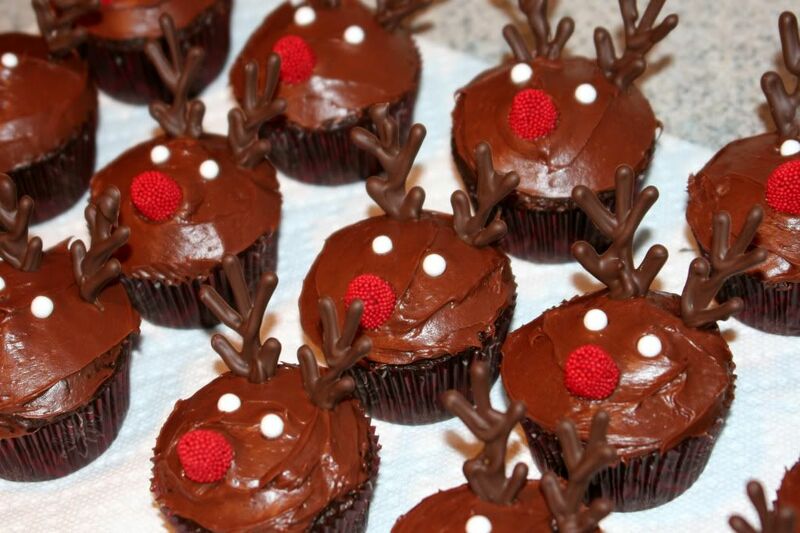 I made the antlers yesterday and the cupcakes came together quickly. For those of you interested in this idea or other fun Christmas treat ideas, click here. I don't even remember where I found it, but I've had it in my idea folder for over a year. It is a video clip from a news channel in Utah. It also includes the cute snowmen I did a couple weeks ago. I'm so grateful for others who share their wonderful talents. Thanks Haldan for all the help. Now I'm looking forward to kicking back with the kids and enjoying our few days before Christmas. Those are so cute!! I don't have the patients to bake things like this. The girls school doesn't allow home baked treats only store bought. Kinda takes the fun out of it and makes you lazy C: oh well. I have to give you sympathy on the snow in the church parking lot. I have a close shave with death weekly in my church parking lot. I would love for nate to wear heels to church one week and see how far he makes it from the car door to the church door. I could use a good laugh C: your family christmas picture is cute and I LOVE pokeys skirt!! Really cute. I had something similar a few year ago and they were my favorite skirts. To bad kids have to grow.